Our partnership with the Department of Transport means at the completion of your training we are also authorised to conduct the practical drivers assessment (PDA) or licence test inhouse which is conducted by an approved RMS Assessor. This unit involves the skills and knowledge required to drive a heavy rigid vehicle safely, in compliance with relevant state/territory roads and traffic authority licence requirements and regulations for heavy rigid vehicles. It includes maintaining systematic and efficient control of all vehicle functions, monitoring traffic and road conditions, managing vehicle condition and performance and effectively managing hazardous situations. Upon successful completion the student is then eligible for RMS to conduct an authorised practical driving assessment on behalf of the Department of Transport leading to an upgrade of your existing licence class to HR (Heavy Rigid). At the completion of your training you will be issued with a Statement of Attainment certificate which is nationally recognised and completes one of the units of competency which contributes to a Certificate III in Driving Operations . This session will take you about an hour and will assist you to understand the truck you will be learning in as well as giving you important safety information prior to commencing your practical training session. You will also be issued with all your theory documentation for completion of the national unit. You can commence this at any time Monday - Friday with no prior booking needed. Course bookings can be made online which will register students for the introductory information session which is conducted at RMS. Upon attendence your practical training can be scheduled at a mutually agreeable time. A heavy vehicle licence has the potential to open up a range of opportunities in the Mining, Civil and Transport Industries and RMS are happy to give you our industry experience by sharing our knowledge of what companies are looking for in a heavy vehicle driver’s. To do this, firstly we believe that currency of equipment is paramount. This means that you need to learn and be familiar with vehicles that are currently being used in the industry by the industry leaders. 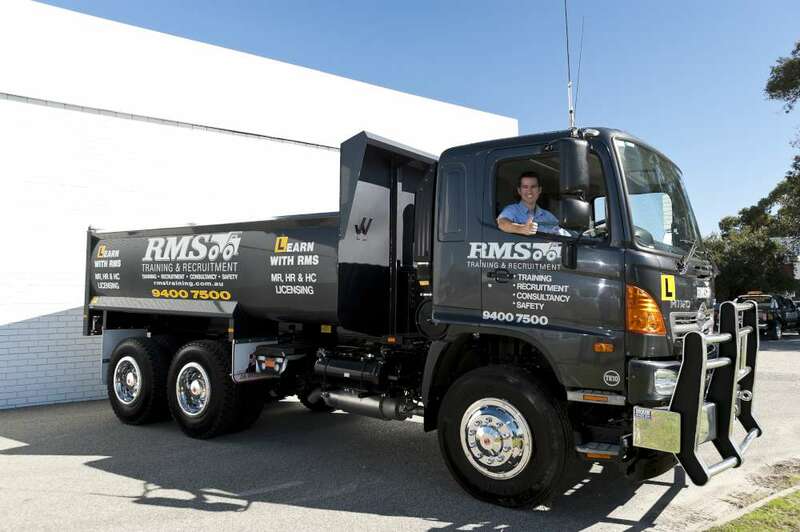 RMS prides itself on providing a modern fleet of industry accepted electronic equipped trucks for you to train in. With state of the art Euro 5 zero emission trucks our commitment to the environment can also be noted. Our fleet consists of late model Hino trucks with various gearbox configurations which you will experience making a more thorough training experience and contributing to you being more adaptable when it comes to your job searching. We like to make sure that our customers stand out from the rest! If you are wanting to improve your job prospects and not really sure of which licence to go for then we would always recommend where possible you don’t limit yourself by getting a restricted licence and wherever possible always aim for the unrestricted status. This will allow you to drive anything in the HR class, manual or automatic as well as cover you for MR (Medium Rigid) as well. The industry however is seeing more and more Automatic trucks coming into the marketplace which will see more opportunities present themselves as time goes on. Currently the Automatic licence is generally acceptable for most Bus driving positions and Mining Haul Trucks however checking company requirements is always recommended before making a decision. Our experience has shown us that on average people tend to take a certain number of hours to get to a satisfactory level of being able to pass their driving test first time. Anything under often may result in a less than adequate result. Currently RMS has a 94% pass rate. For obvious reasons the Automatic licence is generally the quickest and the cheapest with the unrestricted manual taking longer but giving you more coverage of what you are authorised to drive. As a general guide to achieve practical competency or test readiness for the Automatic is usually approx 4hrs practical tuition. The commonality of our truck fleet ensures that whichever truck you are in you will see the same cabin features and controls with no difference between trucks. If you are really serious about opening doors for yourself take our advice and years of experience and don’t short-change yourself. Remember it’s your opportunity not anyone else’s so spend your money wisely. RMS regularly offer special promotions and discounts so always check to see what we have on offer to assist you. RMS can also offer funding opportunities to eligible students for the Heavy Vehicle training. To see if you meet the criteria give us a call and we can discuss further. And if you are still not sure where you would like to do your training why not check out past students reviews on RMS Facebook page at RMS Training.